Cover image via Penguin Random House. Feature image above by Sophie Giraud, courtesy of Canadian Broadcasting Corporation. 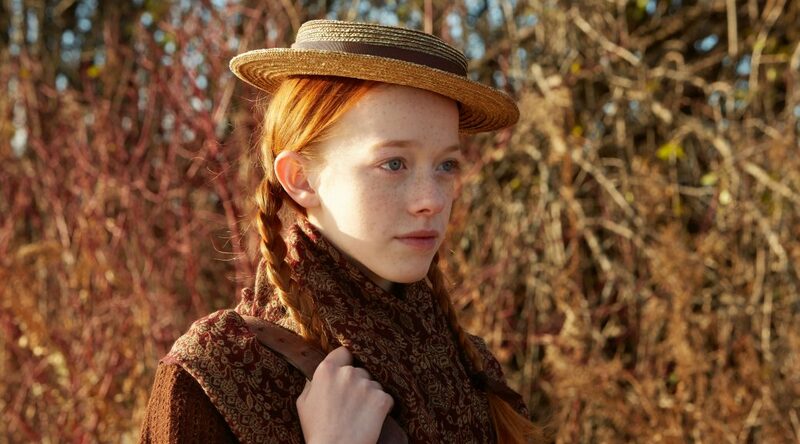 I didn’t like 80s Anne of Green Gables. I’m sorry. I know. People loved 80s Anne. She was funny, and cute, and clever. And the film is well done. But I couldn’t connect. An unwanted child whose defining characteristic was optimistic smarts? Who, when told she couldn’t stay with her new family, looks politely sad, but doesn’t stamp her foot, or otherwise make an angry mess? I couldn’t do it. She was welcome to be charming and resilient and successful over there, while I was messy and cranky and resentful over here. So while I didn’t rush to the new TV adaptation of L.M. Montgomery’s 1908 book, I didn’t approach it with any of the trepidation that others did. And I wasn’t put off by reviews saying the new series was a ‘betrayal’. What I didn’t expect was how fascinated I’d be. I watched it once. Huh. I watched it some more. I got the novel out from the library. I watched the 80s version on DVD. I went back to the 2017 version. Hm. You might’ve heard that the Netflix/Canadian Broadcasting Corporation version is different from the 80s one. It’s visually darker, and it includes some new scenes (the writer is on the record as saying she worked from the novel; she didn’t want to be influenced by the 80s version). In the 2017 version, Anne has flashbacks. We see her being beaten by her former family, and taunted by children in the orphanage. This has annoyed some people. One reviewer said the show ‘strayed disastrously’ from Montgomery’s novel; another (in the New Yorker) that the flashbacks evoked seething, not empathy, and another felt the show revelled in Anne’s suffering. I didn’t feel like that. Some of the scenes go too far (a character dies of a heart attack while beating Anne: really, guys? ), but on the whole, watching Anne’s stunned/sad/angry face, I felt reassured. I knew I was being asked to understand Anne’s experience. Watching her zone out (eyes wide open, the sound of blood rushing through her ears), I thought: yes. It can be like that. But this doesn’t entirely explain my fascination. What I kept coming back to, as I circled around the story in my head, is what these changes might represent. Some of them probably come down to medium: for example, Anne’s 2017 creators have said they added some scenes to ‘show’ events rather than ‘tell’ them (the 80s TV version does this too). And others seem stylistic (the 2017 Cuthberts’ house is more spartan than what we saw in 1985). But at their heart, I think these changes point to an evolution in how we understand childhood. This has been shifting since 1908, for sure. And in my lifetime, too. He deliberately takes Anne all the way back home so that his sister can tell her she’s not wanted? A grown man is so afraid of the world that he would inflict such a disappointment on a child? Well, yes. And Montgomery doesn’t seem to judge Matthew for this (later, of course, Matthew wants Anne to stay). But by 1985, we see his hesitation from the beginning (though we don’t hear his thoughts). Then, 2017 shows us concern as well as connection (Anne and Matthew see each other at the station before he realises who she is, and later the camera zooms in on them shaking hands). We’re allowed to believe that Matthew doesn’t want to let Anne down; that he accepts, on an emotional level at least, his responsibility for her as a child. In 2017, we need that in order to believe in Matthew’s basic goodness. This (and the inclusion of those flashbacks) points to the fact that for contemporary audiences, childhood experiences are formative—and adults cannot be passers-by. Trauma can’t simply be overcome by an innately sunny (or robust) disposition. We’re too invested in nurture to believe that. But I think 1985 viewers were expected to accept it, at least to a point. I’m agnostic on whether this is a good thing. On the one hand, glossing over trauma can reassure viewers that things aren’t so bad; the wider society needn’t change for the benefit of this character. She’ll be all right. On the other, dwelling on trauma risks reducing a child to her circumstances. Which stinks. Perhaps this tension is behind some of the reactions against Anne with an E. Where’s our sunny girl gone? they seem to be saying. Why have you made the world so dark? Well, stories (like the world, and ourselves) change. The Grimm fairy tales, for example, have been evolving since the first edition was published in 1812 (and as oral tales, were changing long before the Grimms wrote them down). In the 1812 edition of Hansel and Gretel, two children are abandoned by their parents. Later versions have them ditched by their stepmother, with the (reluctant) help of their father. And the 1812 house is made of bread, with sugar for windows. The kids seem happy to find it, but it’s not the candy-bedecked confection I drooled over in the 1970s. I could go on debating the differences between these three Annes (and I haven’t even looked into all the other adaptations out there). 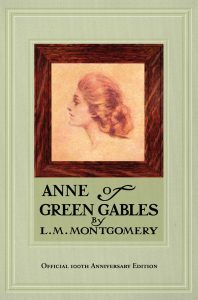 The novel is arguably darker than the 80s film version; there are also comments in the novel (Anne would ‘rather be pretty than clever’, and longs for dimples in her elbows) which don’t translate well today. Which version is ‘better’ is perhaps beside the point. Reading isn’t time travel: we make sense of things in the here and now. And what do I get from this version of Montgomery’s story, as I see it, today? A girl who stands up for herself, who struggles, who doesn’t accept the circumstances she was born into. Who’s clever, and strong, and brave. Who is occasionally ridiculous. And who continues to be all of these things in the face of a world that can seem dark and indifferent. Sitting at my desk in 2017, watching a summer day fade into night, that seems like a win to me.